We actively promote emotional and social well-being, in partnership with parents/carers who are seen as experts on their children. All children are equally valued as unique individuals and are helped to reach their learning potential, within a nurturing environment. Children are encouraged to be independent learners and to have an active role in their learning journey. Excellent links with Christow Primary School with many opportunities to integrate into school life where appropriate e.g. sports day, harvest festival, charity events, assemblies, some trips etc. A covered deck area allowing all weather access to the outdoors and activities such as sand and water and music making. Christow Pre-school is delighted to offer new Forest School sessions for all children attending the Pre-school. Following a successful Big Lottery Fund award, we have developed a purpose built Forest School site adjacent the Pre-school building. The site includes a fire pit, sheltered area, bug hotel, mud kitchen and tree house. We have two level 3 qualified Forest School teachers and offer sessions all year around in this superb outdoor learning environment. The Forest School ethos is based around the idea of children learning to take responsibility for their surrounding environment and inspires children to grow in confidence, self-esteem and independence; we feel it also greatly enriches a child’s Pre-school experience. It is our aim to make our Pre-school accessible to children and families from all sections of the local community, with priority given to children within the school catchment area. However, if there is a waiting list, this is operated in order of date of birth to give each child the opportunity to attend. Please note that attendance at the unit is not a guarantee of a place at Christow Primary School. To apply to Christow Pre-school, please contact the School office on 01647 252542 or email Sharon Fleming on pre.school@christowprimary.org.uk and we will arrange a time for you to come and visit and discuss your child’s requirements. 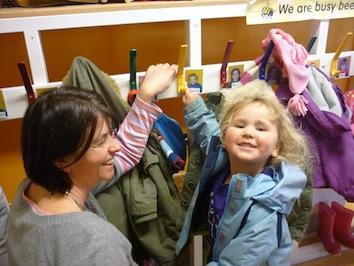 Every new child receives a visit at home from a member of our staff and the Pre-school Leader. This gives us the chance to get to know more about your child in their own home environment and can make a very big difference to how they feel about coming to the Pre-school. Children are welcome to attend some taster sessions in the weeks before starting and parents/carers are encouraged to accompany them. These mornings are aimed at giving your child a gentle introduction to the people and the Pre-school environment and a chance for the parents to help ensure their child is happy and confident. A child who is anxious or unhappy will not be able to play or learn properly so we are keen to work closely with parents/carers to ensure your child feels happy and secure. Please note that we also run a baby and toddler group at the Pre-school on Monday mornings (10am to 11:30am term time) which is great opportunity for your child to get used to the environment of of he Pre-school before they are old enough to attend. We are open 9am-12 noon Tuesday to Friday and 1pm – 3pm on Tuesday, Wednesday and Thursday. We also run a lunch club from 12 – 1pm on Tuesday, Wednesday and Thursday. You are able to choose sessions to suit you and your child. Ask our Pre-school leader about availability. Help each child to feel that he/she is a valued member of the group. Ensure the safety of each child. Help children to gain from the social experience of being part of a group. Provide children with opportunities to learn and help them value learning. We organise our sessions so that the children can choose from, and work at, a range of activities and, in doing so, build up their ability to select and work through a task to its completion. The children are also helped and encouraged to take part in adult-led small and large group activities, which introduce them to new experiences and help them to gain new skills, as well as helping them to learn to work with others. Outdoor activities contribute to children’s health, their physical development and their knowledge of the world around them. With our great outdoor resources and soon to be opened ‘Forest School’, children have the opportunity, and are actively encouraged, to take part in outdoor child-chosen and adult-led activities, as well as those provided in the indoor playroom. On Friday Christow Babies and Toddler Group is hosted at the pre-school from 1.30 – 3pm. This informal and friendly session provides a stimulating environment for little ones and as well as an opportunity for parents/carers to chat and meet other like-minded individuals. Each week we have a craft or messy play activity followed by singing. Coffee and tea is provided for grown-ups and a snack for little ones. The welcoming group meets term-times on Friday from 1.30 – 3pm. This is a great opportunity for children to get used to the pre-school setting before they are old enough to attend. Charges are £2.50 for first sibling (over 1 year old) with each further sibling 50p. Babies under one are £1 and the first session is free. Children who are not yet eligible for funding or who have exceeded their funded allowance of 15 hours per week are charged at an hourly rate of £3.70 for the additional sessions. Lunch club is charged at £3.70 for all children. Ifyou are having to pay for your child to attend Pre-School, either because they are not yet three and eligible for funding or because you have exceeded your 15 hours of allocated funding then you should be able to reduce your childcare costs by using childcare vouchers. The Childcare Voucher Scheme allows your employer to pay you in Childcare Vouchers prior to tax being taken off through a salary sacrifice scheme. If you would like more information please see either the Pre-School leader or ask your employer for details of the scheme.